The reason your chimney needs annual cleaning and a chimney sweep is because the smoke produced by your fire has tiny unburned flammable solid particles and oils from the wood which adhere to the walls of your chimney flue as soot. This soot is what a Chimney Sweep takes out of the chimney during a chimney cleaning. 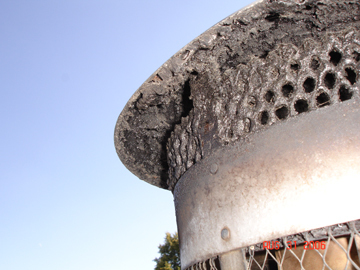 Over time the soot in your chimney is refined by heat and becomes an extremely flammable material called creosote. A lot of people don’t realize the creosote in their chimney is flammable, and all it takes is a tine spark or ember to ignite the creosote and start a chimney fire, where the actual walls of your chimney flue are on fire. 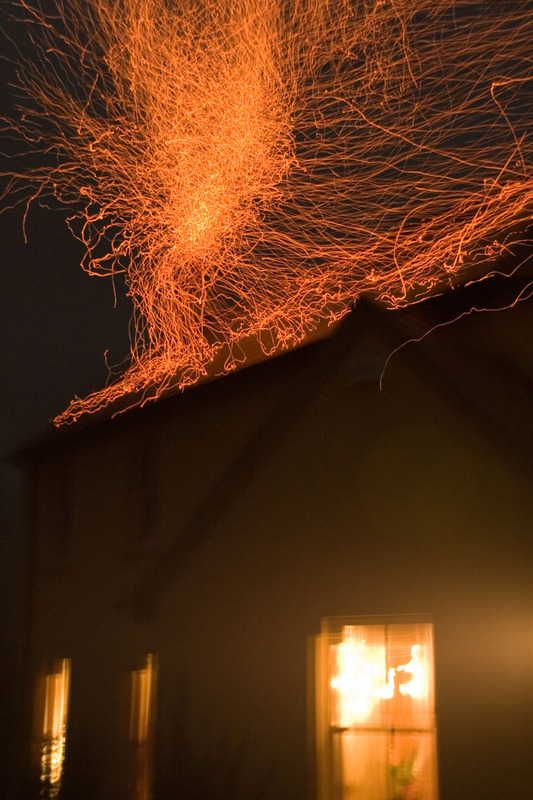 Chimney fires burn at over 2,000 degrees and can easily spread to the rest of your house. You need a chimney sweep to remove the creosote from your chimney flue. Chimneys and pipes like the ones on wood stoves are designed for smoke to pass through at relatively low temperatures; they are not built to withstand chimney fires which can burn at 2,000 degrees. A chimney or flue fire occurs when the build-up of creosote gets hot enough to burn. 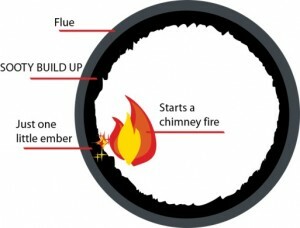 The fire can spread from the chimney or flue through cracks, loose mortar, small separations in flue pipe, and/or loose or missing flue caps or screens and get into the wall partitions or onto the roof. Sparks and flames shooting from the chimney/flue top. Stove and/or stove pipe vibrating. Call 9-1-1 before trying to put out the fire. Close damper(s). If the stove is airtight, keep the door closed to cut off the air supply to the firebox. If it’s not airtight, and if the fire in the firebox is small, one might attempt to use a chemical fire extinguisher to slow the fire. NEVER use water – the stove could crack if too hot. Check the roof for sparks and fire spread. NOTE: Any time there is a chimney or flue fire call 9-1-1. Even if you feel you have the problem under control. There could be fire that has extended into your walls, attic or roof.